Running and joining road races incur relatively lower costs than other hobbies, making it one of the easier ones to pick up, sustain and more frequently indulge in. A major brand event in town typically will set you back between RM40-70, depending on the distance and time you joined (most will employ early bird options). Race entry fees pay for a number of things for the event organizers: timing chip technology, t-shirts, the goodies you get during and at the end of the run, compensating city council and police to control traffic, allocation for charity, and other logistics costs. 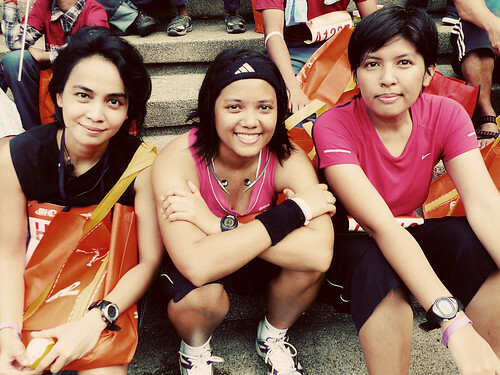 When Mims told me BHP was organizing an 11k race in July for only 5 ringgit, signing up was a no brainer. Not only was this the lowest I’ve ever paid for a race, the flag-off venue was near to where I lived, so that was a bonus for me. In addition, all money collected was to be donated to 3 charity homes. I later learned that once upon a time the Orange Run used to be free. To sign up, I downloaded and printed a form and headed down to a participating BHP petrol station in Taman Tun to exchange it for a race bib and a few safety pins. With such a low entry fee, t-shirts and timing chips were obviously not in the race kit (what race kit?). At the very least the running bib is important, because behind it is where you scribble down your emergency contact and phone number, should something happen to you. Getting to the Curve in Mutiara Damansara was a cinch and hassle-free. The dawn sky was still slightly dark and it was a miracle that I managed to find Mims in the crowd without calling her. I asked if she could pace me, and she agreed. Flag-off time for the ladies was 7am, and with the guys all crowding and cheering all around us, it was an electric start to the morning. The men would join us all 15 minutes later. In total, there was some 5,000 of us trampling the tarmac. I particularly loved the Orange Run because I was running through familiar grounds. At the start we ran past the Curve and Ikea, and Mims proceeded to set a comfortable pace, advising me not to start off so fast (I tended to be a strong starter but slow finisher – so much to learn as a newbie!). Then we headed on to enter Mutiara Damansara, past people’s nice and neat bungalows. Some owners were intrigued and decided to hang around their front yard to watch us stream by. Just before the end of km2 I could not longer keep to Mims’ speed, so I waved at her appreciatively as she turned back to look at us, and gestured her to move on. So Mims sped off, leaving us behind to cruise our way through the course. I wasn’t in the best of shape at the time, having just recovered from a fever, so running felt like a chore. Ev was also struggling a little too, having recently received a jab at the clinic for food poisoning. Getting an injection in the rump does little to help your running form, apparently. Going on what we had, we bade a ‘see ya later’ to Mutiara Damansara to venture into Sunway Damansara where condos aplenty loomed ahead; I then sighted our first water station after about 4km. They served isotonic drinks here, so we gulped our drinks down, threw our cups away (dramatically, of course) and continued our way. As we’re approaching the Bandar Utama district it gets a bit more hilly and lactic acid is building up like crazy in the leg regions. I heaved through this territory with a much reduced pace. I passed over a bridge road overseeing a lot of greenery and started having strange yearnings of bungee jumping off the bridge. Oh, the random things that go through your mind when you run. I snapped out of it, blamed the antibiotics and hurried along. After weaving through a curvy and hilly back road near the Sony Center in BU, we took a left past Kolej Bandar Utama and I roughly calculated we had somewhere between 2-3km left to go in the race. In front of Center Point, I caught up with a person whose pace matched mine, and I targeted her as a reference to not fall behind. I drafted behind her for a while, then overtook her, and I could tell she sensed a little bit of competition. So she accelerated and overtook me, and then I reciprocated. It went on like that for about 100-150m until I finally stopped paying attention and lost her from my sight. Then I saw the Curve ahead – finally the race was going to be over! I held my chin up and ran through the finish line and I was done. The last part of the race is always something you want to finish strong and not look like a bag of limp weeds because so many eyes are watching you. Of course by then, hundreds of finished runners were already lingering in the mall area with drinks and food in their hands and mouths. We also received our goodie bags, loud orange and reusable ones filled with vouchers for discounts off petrol and Brooks shoes. There was no finisher’s medal, only a finisher’s certificate with a blank line for you to fill up your own name. After-race happenings were just that: happening. Music was playing loudly, the atmosphere was lively and people were queuing up for all sorts of refreshments under the sun. The pièce de résistance was of course was the breakfast that we locals adore: fist-sized packages of oily and spicy nasi lemak and free-flow of sweet teh tarik! If there’s anything Malaysians are absolutely talented at, it’s carbo-loading, calories be damned. Later on the organizers held prize givings for the top 3 runners of each race category, followed by lucky draw contests in which the emcee called out random bib numbers. We stayed of course, hoping to get lucky, but we weren’t. The chosen ones walked away with noteworthy gifts like free round trip flight tickets to exotic beach holidays, and gadgets like tablets and mobile phones. So for some people that morning, apart from gaining health benefits and breaking personal records, the RM5 certainly stretched a long way. And so I finished this 11k route in about 90 mins, my 3rd race in 2011 to add to my book of personal running accomplishments. A race so well executed in a prime location for a price so easy on the pocket, I’d pin the orange bib again any day.